It is time for fiscal stimulus to gradually assume more of the burden of propping up a global economy that still looks worryingly fragile. Central banks are not about to abandon either quantitative easing (QE) - buying assets with newly printed money – or ultra-low borrowing costs. In a world where the desire to save far outweighs the appetite to invest, interest rates look set to stay very low for a long time. But a consensus is forming that driving interest rates lower and lower could do more harm than good by squeezing banks’ profit margins and dousing their willingness to finance economic expansion. Record low bond yields also make it tough for pension funds and insurance companies to keep their payout promises. Yields are negative on some $13 trillion of government debt globally, and two European companies this week became the first non-state firms to issue negative-yielding debt. The Bank of Japan (BoJ), which in 1999 became the first central bank to cut rates to zero, looks set to be the first to signal that monetary policy is approaching its frontier. BoJ Governor Haruhiko Kuroda acknowledged in a recent speech(opens in new window) that the bank’s imposition of negative interest rates in January had damaged banks’ profitability. Although Kuroda has not ruled out another rate cut in order to boost growth and so help hit his inflation target of 2%, speculation is rife that the BoJ will overhaul its policy, perhaps by targeting bond yields. The central bank is due to publish on 21 September a 'comprehensive assessment' of its monetary stance since 2013. There are sound practical reasons why the BoJ might start to unwind its aggressive QE programme: it already owns more than one-third of Japanese government bonds and is running out of debt to buy. The European Central Bank faces the same problem. By the end of the year, it may have bought up half of all government debt that is eligible for purchase under the bank’s 80 billion-euros-a-month bond buying scheme. As the scope for more monetary accommodation diminishes, political support is growing for greater fiscal policy activism. US presidential candidates Hillary Clinton and Donald Trump have both promised to spend more on infrastructure if elected. New UK Prime Minister Theresa May has abandoned the previous government’s goal of balancing the budget by 2020. Japan recently announced more fiscal stimulus. The European Union is gradually relaxing the debt and deficit constraints on member states enshrined in the Stability and Growth Pact. Even fiscally conservative Germany has flagged modest tax cuts in 2017, an election year. Speaking at a news conference on 8 September, ECB President Mario Draghi referred approvingly to a 'very powerful' commitment by G20 leaders at the recent Hangzhou summit to use all tools, including fiscal policy, to shore up growth. 'Monetary policy alone cannot lead to balanced growth,' the G20 said. 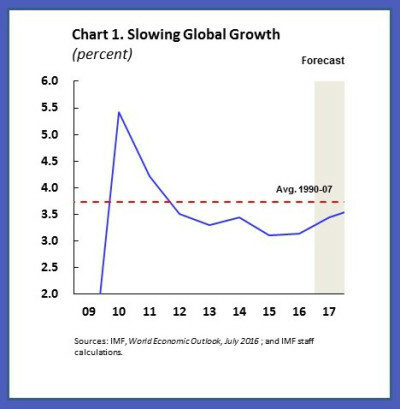 The group’s statement was a frank admission that, eight years after the great financial crisis, the world economy still needs vigorous policy support of one form or another. To be sure, there are encouraging developments. After an early-year swoon, the Chinese economy has stabilized thanks to government stimulus while Brazil may be over the worst of a fierce recession. On the other side of the ledger, the US added fewer jobs than expected in August and wage growth slowed. Manufacturing contracted for the first time in six months and activity in the service sector plumbed a six-year low. The Federal Reserve now looks unlikely to raise interest rates at its policy meeting this month. Germany, the euro area’s largest economy, is also is going through a soft patch, with industrial output falling in July and factory orders weak. In Britain, forecasts of an immediate slump following the 23 June vote to leave the EU have not materialised, but many economists still expect a marked slowdown as companies put investment plans on hold. As the G20 acknowledged, global growth is still too weak and risks remain to the downside. It is not natural to make a bank pay to deposit spare funds with its central bank. Nor is it natural for a government or a company to be paid for issuing debt. But, equally, it is not natural for the world economy to take so long to recover from a crisis. These are exceptional times.